Rest EZ is proving to be the absolute calving ease bull that we thought he would be. He is a bigger framed, extra long bodied bull with a super hoof on him. Rest EZ is heavily muscled! 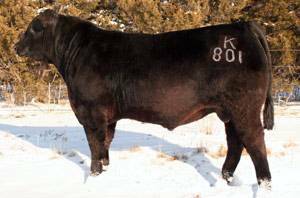 His calves have averaged under 70# on heifers and cows in a cold SD year at Goldammer & Koupal B&B Angus. The vigor is incredible on Rest EZ progeny.